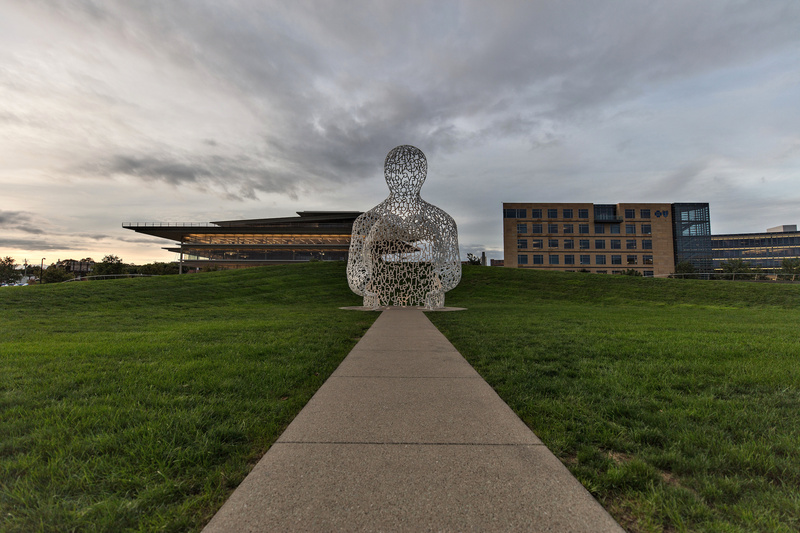 Pappajohn Sculpture Park, Des Moines, Iowa �Nomade� Artist: Jaume Plensa (Spanish, born 1955) Dimensions: Overall: 27 � 17 � 18 ft., 12000 lb. (823.2 � 518.3 � 548.8 cm., 5443.2 kg.) Credit Line: Des Moines Art Center Permanent Collections; Gift of John and Mary Pappajohn, 2015.3 Jaume Plensa uses letters as the basic components of much of his art, which explores communication issues whether between individuals or cultures. This work depicts a crouching, anonymous figure, with a "skin" composed of letters from the Latin alphabet. The sculpture exemplifies Plensa's ongoing interest in ideas presented in written text, as well as the human body and how it perceives the world around it. He has described individual letters or symbols as components that have little or no meaning on their own, but blossom into words, thoughts, and language when combined with others. Plensa's screens of letters offer a metaphor for human culture, in which a person alone has limited potential, but when formed into groups or societies, becomes stronger. Nomade engages the viewer on many levels, from our recognition of the letters that form the shape, to our own physical interaction with the work as we view it from afar or from inside the work's interior space. Awesome and unusual take on this sculpture in Pappajohns Park. I've seen several versions, but this is the most impressive I've seen lately. Great job. I see lights embedded in the concrete base, and the small amount of ambient from the overcast sky just barely allows us to see the space below the hands is open, an entry point for visitors. Considering the position of those lights, shining upwards inside the sculpture, I would love to see a night capture of this scene, maybe a little closer and a lower angle to possibly catch stars above (of course, that would require a cloudless, moonless night. I just now noticed, when taking a much closer view of your shot, Bruce, is that the spots on either side of the opening, right where the wrists would be, close to the ground level, the shape of the opening actually forms a bench, one on each side, possibly intended for visitors to sit and contemplate the message of the art piece as it pertains to them. Okay... that being the case, I think that a man and a woman, of average but similar slim body type and height, and the same hair color, each dressed completely in black, could be talked into modeling here. Each one seated on opposite benches, right at the opening, and facing at an angle between facing the center and facing each other (so the viewer can see their genders obviously from their silhouettes), the black and white of the sculpture at night would combine and match that of the couple. I think that, Bruce, would be utilizing art to create more art. Just a thought, anyway. Interesting piece! Did you take a closer shot without the background buildings?